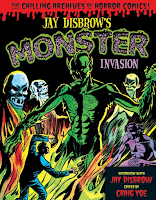 During the fifties, Jay Disbrow was a versatile writer and illustrator who dabbled in a variety of comic genres, but I’ll give you one guess which genre is the focus of Craig Yoe’s latest anthology, Jay Disbrow’s Monster Invasion. Despite some trepidation over the “gross” leanings of top-dog E.C.’s comics, Disbrow threw himself into fashioning horror tales for comics such as Ghostly Weird Stories, Forbidden Worlds, and Spook. His stories tend to be somewhat routine, but his artwork, which revels in giant, hairy monsters and some of the most deliberately ugly faces you’ll ever see outside of a nightmare, is distinctive indeed. Other storytellers are behind the most compellingly far-out plots. His publisher, L.B. Cole, contributed the synopsis for “The Beast from Below”, in which a miner who fails to incite a labor strike turns into a giant murder monkey. Disbrow confesses that “The Insider”, in which a monster emerges from a book, is “a shameful swipe from H.P. Lovecraft’s ‘The Outsider’”… a story Disbrow apparently loved so much that he adapted it again as “Dwellers in Darkness”. Graw!